Canada's status of women minister made the comment at an all-candidate's meeting Wednesday. A high-profile Conservative incumbent told a crowd gathered at an all-candidates meeting on Wednesday that she is anti-abortion. “I am pro-life,” Leitch said at a Collingwood Royal Canadian Legion. She credited her experience as a pediatric surgeon as a factor in upholding her anti-abortion position. Green Party candidate Joanne Fleming spoke before Letich, but made no mention of abortion in her answer. 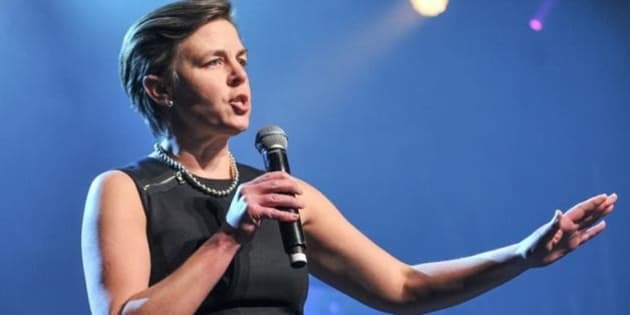 According to information collected from Campaign for Life, a coalition charting the abortion stances of Simcoe-Grey candidates, Leitch was the only one to not disclose her position. The Huffington Post Canada reached Dr. Leitch’s campaign office for comment but received no official response before publication. Leitch and Fleming were joined by three other candidates including NDP’s David Matthews, Liberals’ Mike MacEachern, and the Christian Heritage Party’s Len Noordegraaf. Party leader Justin Trudeau made headlines last year after he announced that anti-abortion candidates would not be permitted to run for his party. However, incumbent Liberal MPs opposed to abortion are allowed to seek re-election, but must support a woman's right to choose in any future vote on the matter. Abortion hasn’t received much attention from federal leaders throughout the campaign as a marquee election issue. But it did come up Wednesday during a CBC Radio roundtable discussion in P.E.I. when Cardigan Conservative candidate Julius Patkai criticized incumbent Liberal candidate Lawrence MacAulay for abandoning his anti-abortion stance to align with Trudeau. MacAulay admitted that the subject has been “a very difficult” topic. “People know I’m pro-life,” he said. Conservative Leader Stephen Harper has repeatedly pledged that that he has no intention to reopen the abortion debate as long as he is prime minister. “The government will not bring forward any such legislation, and any such legislation that is brought forward will be defeated. This is not the priority of the Canadian people, or of this government,” Harper said in 2011. Rona Ambrose, status of women minister between 2010 to 2013, voted in favour of the motion at the time — a move that immediately brought scrutiny over her appointment to the position. Leitch voted against the motion, and it was defeated by a vote of 203-91 in the House of Commons.